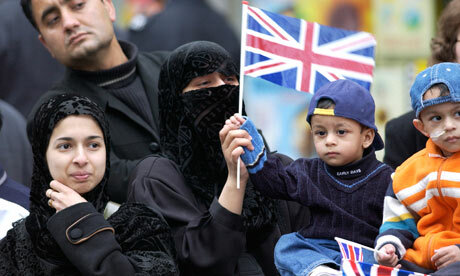 You can do that look British people do to each other, when someone near by is making a scene, in a full face veil. You will be happy they pray a lot when you get stabbed on your door step and are too scared to go outside. So you time your trips to the shops to coincide with these prays as the streets are full of friendly people. Muslims, like all British people have that one problematic uncle that kinda ruins family occasions. When confronted with something out of their comfort zone, like me and my boyfriend in full drag dancing down the road, muslims like all British people get flustered and over compensate with being overly polite — a bit like Hugh Grant. When finding out you have been dating your boyfriend for 5 years your muslim neighbours will be disgusted that you haven’t proposed. You hear “get a civil partnership — for your mothers sake” a lot. Apparently there is usually half a cup of tea next to the pray matt when praying at home — especially for morning prayers. …and that their son is a heartbreaker even though its clear to everyone else that he spends all his time on his Xbox. Young muslim women are really, really, really ambitious. There is always an Aunt who gets too involved in the wedding planning and annoys the bride. During ramadan and eid there will be so many people on the streets going to mosque that the drugs dealers will have to move to other places — making your area really safe for a while. Mothers will say anything to stop their kids nagging them. I once saw a Muslim mother tell her kid that wanted some fried chicken, after Friday night prayers, that the shop wasn’t halal even though there was a 5ft sq neon halal sign in the window. Reminds me of when my mum told me that the chip shop was closed for a private event as she wanted some peace. Click the heart at the bottom if you liked this article to show more people. Builds digital campaigns around people and data, suburban progressive, vest aficionado, Wilde, Lauper and Russell T. Davies fan.